I opened my Wall Street Journal this morning to find a front page article (print version) on the Haynesville Shale. 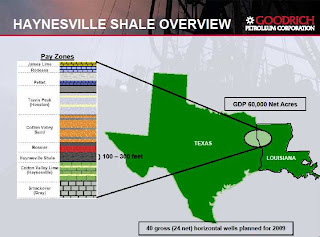 The article doesn't contain a lot of new information, but it gives a very good background on the Haynesville Shale, the Barnett Shale and the natural gas industry. It talks about gas prices, the impacts to the local area, the supply/demand issues, the Pickens Plan and all kinds of good stuff. Worth the read to put (or keep) everything in perspective. Southwestern Energy provided some interesting information about natural gas supply and demand in a recent investor presentation. I excerpted a few slides that I thought put the current industry slump in perspective. 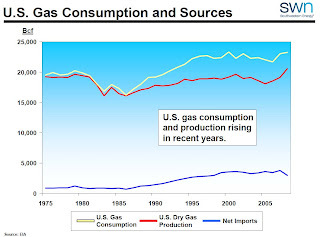 The first slide shows thirty years of gas consumption and how the supply component is balanced between U.S. drilling and LNG imports. It's nice to see that domestic drilling rather than foreign imports really drives the natural gas industry. This is something it is important for our leaders in Washington, top to bottom, to understand. This next slide is equally telling. 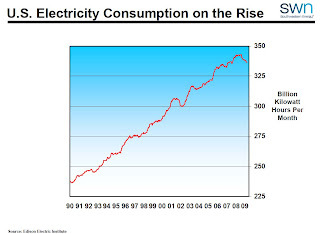 The chart showing electricity consumption has been at a 45 degree angle since 1990. I keep hearing that we as a nation are now different - no more McMansions and conservation is the name of the game. I think we need more than six months of data from an economic downturn to establish a real trend. Haven't we seen this before? Look at 2002 - does it look familiar? I sincerely hope we have turned the corner as a nation in terms of consumption. We are a ridiculous people with all of our excess and waste. But will there be any substantive change overnight? Gasoline prices have dropped from $4 to $2 and suddenly people are buying trucks instead of hybrids again. My point is that we are a nation bred on consumption with a yearning for excess. I think we're going to continue to use more power. 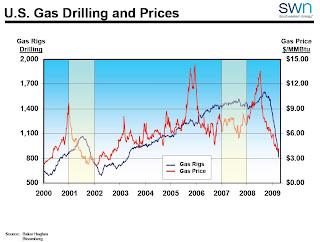 The slide below is interesting because it shows the cyclical nature of natural gas prices over the past decade compared to the rig count. Rigs have largely remained steady except in 2002 and 2008-9. Seeing the steep decline of both, it makes you realize that a trough is coming soon - the question is how much more blood will be spilled? 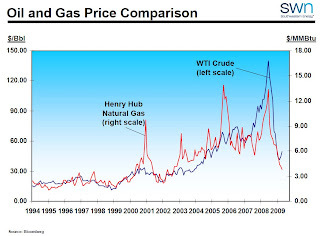 The final chart I thought was interesting compared oil and natural gas commodity prices since 1994. It shows that the price of gas is so much more volatile than that of oil if you don't consider the insane oil price run-up of last summer. The chart also shows that while gas is more volatile in price, oil and gas largely move together. Wall Street analysts focus on this too, as they constantly quote the differential in terms of a ratio. Note in the most recent entries how divergent oil and gas are right now. If history is any guide, something has got to give. Labels: Miscellaneous, Natural Gas Prices, Rig Counts, Southwestern Energy Co. The past twelve months for Chesapeake Energy CEO Aubrey McClendon have seen highs and lows of meteoric proportions. First, Chesapeake broke the news of the Haynesville Shale last spring. Aubrey gets a big feature article in Fortune Magazine. Chesapeake gets lots of attention. But the company and its competitors suddenly find themselves having to shell out huge lease bonuses to suddenly over-informed property owners, a situation that haunts these companies as natural gas prices have dropped, challenging the economics of these new wells. Hooray! Over the summer, the price of natural gas shot up to around $13.50! Chesapeake looks brilliant tying up lots of new leases and beginning to drill aggressively. But Chesapeake had done such a good job of hedging natural gas prices as they rose that the company has to show huge accounting losses when reporting earnings to reflect the market value of the positions. Ouch, stung by their own foresight and success. Oh no! The price of natural gas falls off the cliff and everyone in the industry gets hammered, but remember those hedges - they help keep Chesapeake out of the trench. Also, the company enters into joint venture and sale arrangements with big fish like Plains Exploration, StatoilHydro and BP to monetize most of its shale positions. Chesapeake is the envy of every company in the field. But the company's stock price still gets hammered, which leads to enormous margin calls for CEO McClendon, who had used the value of his Chesapeake shares to borrow money, presumably to buy more shares, among other things. The margin calls in October require him to sell 31.5 million shares, or 94% of his holdings, at depressed prices (there was no "up" here, just "down"). In December he signs a huge contract with a one-time $75 million bonus and receives a grant of $32.7 million of stock. The company also agrees to buy Aubrey's collection of maps and artwork for $12.1 million (!!!). In all, the package is worth $112 million. It's so good to have friends on the board's compensation committee. All in all, it's been a wild ride for Aubrey. No more Forbes 400 or the Billionaire's List, but he's working his way back there. Unfortunately for him and Chesapeake, the compensation is suddenly getting lots of attention. It was ranked as one of the five dumbest things on Wall Street this week by thestreet.com. I wasn't going to mention any of this until I opened the Wall Street Journal and saw a big article on the front page of the "Marketplace" section focused on shareholder outrage regarding the pay package. It got me thinking about my ups and downs, my good days and bad days. My own life, even on its most hectic day can't compare to Aubrey's. I can't wait to see the next act in the Aubrey McClendon Show. 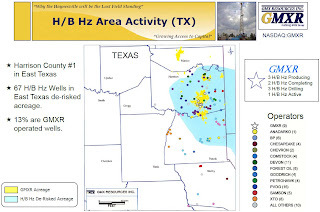 Cubic Energy blitzed the airwaves with the announcement hat another of its minority owned wells wells that is operated by Chesapeake Energy hit. From the announcement: "The Clingman Acres 11H well was tested by the state to be flowing at a rate of 17,040 Mcf/day, on a 24/64 inch choke, with 6,170 pounds of flowing pressure, from the Haynesville Shale formation. A 10 stage fracture stimulation completion technique was performed on this well. This well was completed in February 2009; however, pursuant to a confidentiality agreement with Chesapeake, Cubic is precluded from releasing any flow information until a state test has been filed of record." The well is located in Section 11, Township 15N, Range 15W in the Caspiana Field in Caddo Parish, Louisiana, which is contiguous to the east side of Cubic's Johnson Branch acreage. Cubic has an estimated 2.8% working interest in the well. Yet another pipeline that is being built to serve the Haynesville Shale is the LaCrosse Pipeline by Enbridge, Inc. "Open season" for the pipeline was announced April 1, 2009 and it closes May 15. The pipeline will be 42" and 36" pipe running approximately 300 miles from Carthage, TX to the Sonat Pipeline in Washington Parish, LA. A future expansion might extend the pipeline to Wiggins, MS. The capacity is expected to be 1.0 Bcfe/day, expandable to 1.8 Bcfe/day. The pipeline will have between six and twelve interconnections. Completion of the $1.2 billion project is expected in 2011 or 2012. More information is available on the project's website. 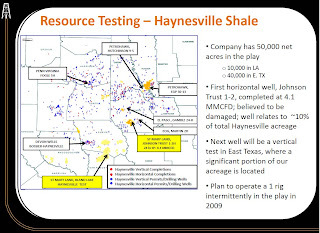 "Testing the Haynesville Shale in North Louisiana, EOG drilled two horizontal wells on its acreage during 2008. The Martin Timber #2H tested at a rate of 17.4 million cubic feet per day (MMcfd), gross with 4,700 psi flowing tubing pressure. The Bedsole 27#1H tested at a rate of 17.5 MMcfd, gross with 7,400 psi flowing tubing pressure. EOG has 100 and 57 percent working interest in the wells, respectively. Due to pipeline limitations, the wells are currently producing at a combined restricted rate of 17 MMcfd until additional infrastructure is in place. 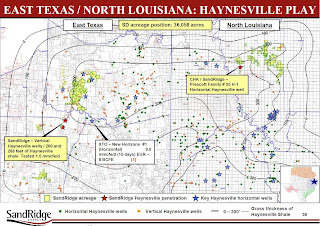 EOG has estimated net reserve potential of 3 to 4 trillion cubic feet of natural gas on its 116,000 net acres and expects to drill 14 Haynesville wells in 2009." SandRidge Energy is better known for its positions in the West Texas Overthrust, but it has a decent position of just over 36,000 acres in the Haynesville Shale. Most of the company's acreage, 22,500 acres, is in Rusk and Harrison Counties, TX. The company has drilled two vertical test wells in the Oakhill Field in Rusk County, encoutering 260 and 288 feet of Haynesville Shale. The first well tested at an initial rate of 1.5 Mmcfe/day. 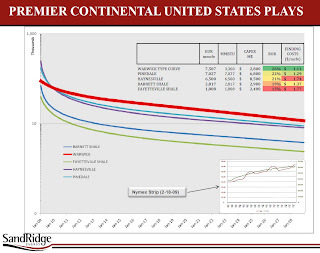 Included in SandRidge's materials was a comparison of decline curves for various gas plays. 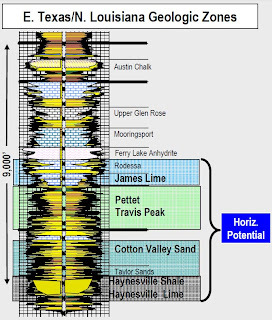 The Haynesville type curve is the purple line below, third down from the top. Included in the comparison are the Warwick and Pinedale Fields in the West Texas Overthrust. 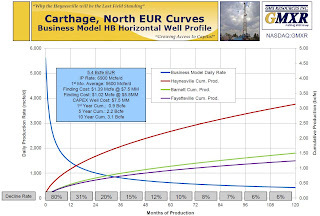 Of the three shale plays, Haynesville, Barnett and Fayetteville, the Haynesville curve seems to have the most positive long-term characteristics. 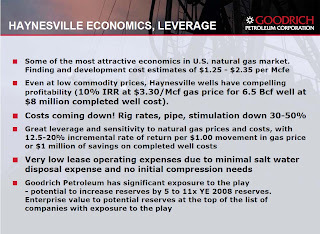 The slide also shows what we already know, that the upfront capital costs of drilling and leasing are more expensive in the Haynesville Play. Last week, the Shreveport Times published an editorial discussing the need to balance the business of drilling for gas in the Haynesville Shale with the need for the process to be respectful to the surface uses. While the Haynesville Play is certainly a huge windfall to NE Louisiana and East Texas, its development needs to be balanced with its potential impacts. The issues of groundwater usage, noise, road wear and tear, etc. are beginning to appear. The state and local regulatory bodies need to balance the economic benefits with the orderly removal of the resources. The chaotic land grab that characterized the leasing of the play must not be replicated in the production phase. The quickest way to kill the golden goose is to let it smother itself. The gas isn't going away. Lest people run around shouting that excessive regulation is going to run off production companies, I think the last line of the editorial says it best: "One area government official recounts a threat that too many government restrictions could lead one exploration company to leave a parish altogether. How that company would take the Haynesville Shale with them was uncertain." Patience and foresight should rule the process, not greed and speed. 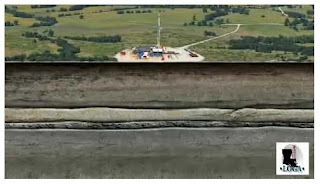 The Louisiana Oil and Gas Association has created a really good animated explanation of the process of drilling a horizontal well such as those used in the Haynesville Shale (the link takes you to a page where you can start the video). The video goes through all of the stages from drilling to fracing to putting the product in the pipeline in a easy to understand animation. El Paso Corporation is another quiet Haynesville Shale player. This may be because the company places a greater emphasis on its midstream operations, which are especially attractive given their size and scope. The company is not terribly forthcoming about its Haynesville activities at this point. In 2009, it plans to dedicate 35% of its $0.9 to $1.3 billion drilling program, or between $315 and $455 million, to its north Louisiana properties. In the Haynesville Play, El Paso is operating in the Holly, Bethany-Longstreet and Logansport fields. 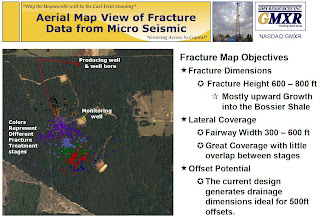 They have engaged in some Haynesville drilling, but they have not publicized the results. Again, the Baker Hughes rig count for the U.S. is down. This week, the rig count dropped by 20 from 975 to 955. In the Haynesville Shale region, the rig count in north Louisiana dropped (for the first time this month) from 75 to 73. In East Texas, the rig count dropped from 66 to 62. The Texas count has been dropping for a while. This is the first time the Louisiana count has dropped in a few weeks, but it the count still higher than it was at the beginning of the month. The bottom line is that natural gas supply is going to be going down. Devon Energy is another one of those companies that is quietly sitting on a huge position in the Haynesville Shale (570,000 net acres). Much of this is likely held by production (HBP), as the royalty burden is less than 20% and the company only added 40,000 Haynesville acres in 2008. Devon estimates that it is sitting on 70 Tcf of gas in the play, but they have been very concerned over the past six months on the big picture from a corporate perspective. They are cutting spending, preserving cash and strengthening their balance sheet. This is all good stuff for Devon and it positions the company to survive the downturn in gas prices, but it doesn't lead to a lot of news on the exploration and production side. In the six months through the end of March 2009, Devon has decreased its company-wide rig count from 112 to 32. The company's 2009 plan is for 11 horizontal wells in the Haynesville Shale, but Devon's mantra is evaluation, evaluation, evaluation. Not production. So they are going to spend money drilling, coring and testing well sites. This activity should put them in position to start a drilling campaign in earnest once gas prices pick up, which is expected by the end of the year. Forest Oil has approximately 140,000 gross acres in the Hanyesville Shale area, but it's not entirely clear that all of these leases have deep rights. Let's assume that most do. 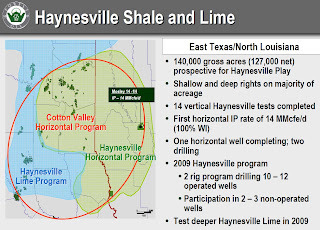 In its acreage, Forest is targeting the Haynesville Shale as well as other shallower formations like the Cotton Valley and Taylor Sands, along with deeper formations like the Haynesville Lime, which is below the shale. The company has completed 14 Haynesville tests and has completed its first horizontal well, the Mosley 14-1H (14 Mmcfe/day initial production). Forest has one additional horizontal well completing and another two drilling. 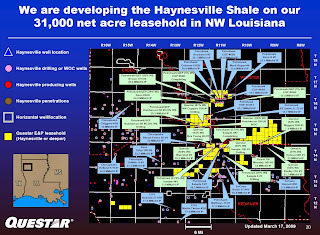 It's 2009 drilling program includes between 10 and 12 Haynesville wells. The company believes that it can drill wells for approximately $7.3 million, which is somewhat lower than the estimates of competitors. For as much net acreage as Encana has leased in the Haynesville Shale (435,000 acres), the company hasn't been active in tooting its own horn about the progress it has made to date. But the quiet Canadian giant made news after its recent earnings conference call (transcript) and made news, by saying that it is doubling spending on the Haynesville Shale while cutting elsewhere and that it expects more than half of its gas production to come from the U.S. in the future. EnCana CEO Randy Eresman told reporters that the costs of drilling in the U.S. is cheaper than in Canada, and EnCana plans to increase its Haynesville capital budget from $290 million to $850 million. EnCana looks at the Haynesville Play as a long term benefit for the company, but he noted that to be truly money making, the shale plays require gas prices to be between $6 and $8 per MMBtu. 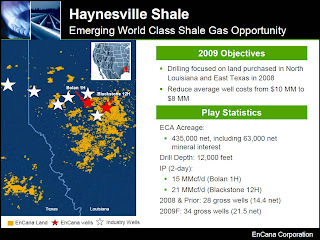 The company admitted that it is increasing its investment in the Haynesville Shale in an effort to hold the leases, which start expiring in 2011, but the additional investment is a testament to EnCana's belief in the long-term potential of the play. 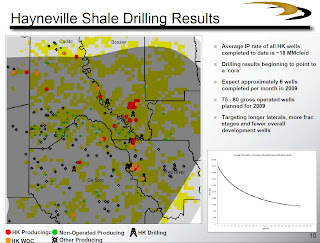 Projecting forward for 2009, Encana expects to drill 50 net wells in the Haynesville Play (the slide above from a presentation states 34 wells, but the 50 number comes from a recent conference call in which EnCana increased its Haynesville capital budget). The company has reported average well costs of $10 million, which it expects to reduce to about $8 million, which is about average across the play, in the coming year. 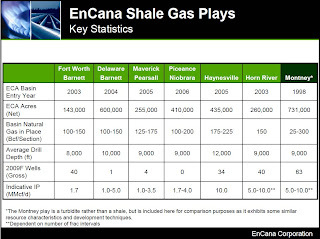 Encana also provided some interesting comparative information across the various shale plays in which it participates. No big surprises: the Haynesville has stronger reserves and higher flow rates, but you have to drill deeper to get to the pay. EnCana also noted that it has committed to 150 million cubic feet per day of capacity on the proposed Gulf South pipeline expansion and another 500 million cubic feet per day of capacity on the proposed ETC Tiger pipeline. 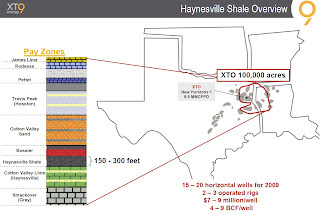 EOG Resources has quietly put together a Haynesville Shale portfolio of 116,000 net acres. I guess since they are a Canadian company, they don't like to shout about their successes (or failures). Or maybe they are more focused on the company's successes in the Bakken play. So far EOG has tested two Haynesville wells that have yielded an average of 17 Mmcfe/day. 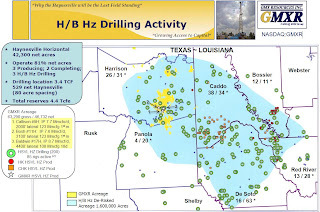 The company plans a total of 14 Haynesville wells in 2009, and they believe they are sitting on a potential 3 to 4 Tcfe of gas reserves in the play. 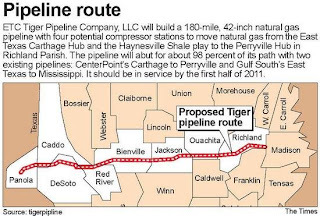 The Shreveport Times reported from a meeting commencing the land acquisition phase of the construction of the 180 mile, 42" Tiger Pipeline from Carthage, TX to Delhi, LA. Since the pipeline will more or less mirror the route of CenterPoint's recently constructed pipeline, the Tiger Pipeline developer, Energy Transfer Partners, doesn't expect too many obstructions to construction. The company believes that they will need to acquire property from about 300 land owners. The project is still on target for a 2011 completion and is expected to cost between $1.0 and $1.2 billion. As the drilling rig count continues to slide off a cliff, I noticed a graphic in the Wall Street Journal that said it all (and showed the falloff literally, if not purposefully, as a cliff). This image says it all. Rig counts in U.S. dropped to 975, down 30 from last week and 852 from this time last year, the first time the number has been below 1,000 since 2003. The good news is that the rig count in north Louisiana was unchanged and is actually up four this week to 75. The news is less positive for the 6th district of Texas, which encompasses the Haynesville Shale. There the rig count dropped by four to 66 rigs. That number is down eight rigs from two weeks ago. What’s most telling is how steep the drop-off is. Rigs are dropping so fast, Chicken Little has to be nervous. What it really tells me is that there will be a sharp drop in supply, especially in natural gas, in the next 6-9 months (unless, of course, LNG floods the market as some predict), which should lead to a commodity price increase. When prices do pick up, there is going to be a mad scramble to restart rigs and assemble crews. It’s going to be chaos and it will likely set the proverbial stage for another boom-bust drilling cycle. Remember the old on the bumper sticker, “Please God, Just Give Me Just One More Oil Boom. I Promise Not to Blow it Next Time”? Yeah, right. Just like semiconductors, oil and gas is a highly cyclical industry that is dangerous for investors. On top of this news, Halliburton, which had hoped to prevent any layoffs, ended up cutting 2,000 jobs, or 12% of its North American work force. 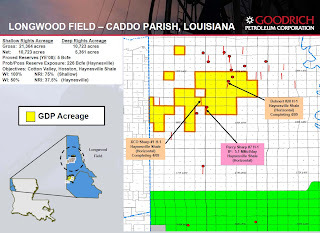 Goodrich Petroleum, with it's hot focus on the Haynesville Shale, had lots to report at the IPAA Conference this week. 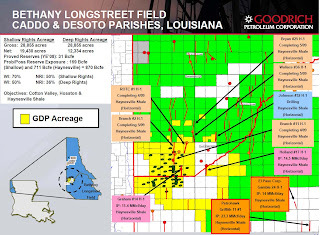 Goodrich has 63,000 net leased acres in the Haynesville Play and has been fairly active in testing and drilling. Most of its active acreage is located in the Bethany Longstreet Field and the Longwood Field in north Louisiana. 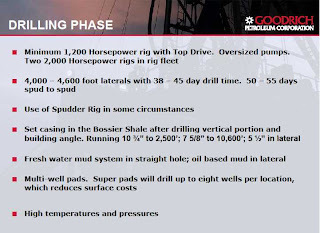 Goodrich has dedicated 65% of its $300 million 2009 capital budget to the Haynesville Shale and plans to drill 40 (gross) wells. Below I've copied a few maps from the presentation showing the activity, both by Goodrich as well as its competitors. 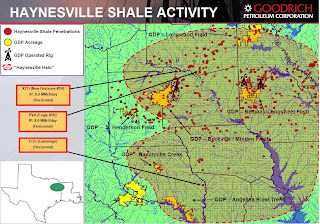 It's interesting to note the sheer number of Haynesville penetrations on the maps. While it's a terrible gas price environment, the exploration companies are continuing to drill. 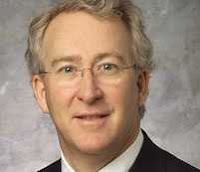 In an address at the IPAA symposium, Chesapeake Energy CEO Aubrey McClendon stated that his company believes that while gas prices and drilling activity will pick up by the end of the year, it will get worse before it gets better. In the classic theme of "always darkest before the dawn," McClendon said, "It's been a difficult past nine months...We're prepared for it to get worse this summer." In his presentation, he said that Chesapeake expects gas prices to return to return to $7.50 to $9.50 possibly by the end of this year. Petrohawk presented today at the IPAA conference in New York and gave some updates on its progress. I've already posted about specific results from the first quarter, so I'll keep it pretty high level here. In general, Petrohawk has about 300,000 net leased acres in the Haynesville Shale and estimates an EUR of 7.5 Bcfe per well. They see development costs of $8.5 to $9.5 million per well, which is higher than some other companies are reporting. 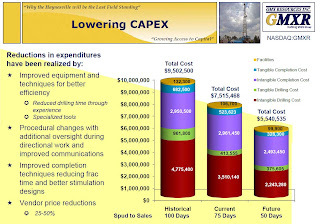 Petrohawk notes that the higher costs relate to the assumption of longer laterals and more frac stages. 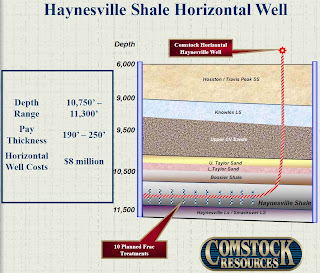 In the slides below, Petrohawk has isolated what it believes is the "core" area (the darker shaded area) of the Haynesville Play through drilling tests. Petrohawk plans to drill between 75 and 80 wells this year, completing about six per month. Interestingly, the slide below has a graphical decline curve for the first eight months or so on a real number basis, rather than percentage basis, for their average IP of 18 Mmcfe/day. Today, Petrohawk Energy announced its progress in the Haynesville Shale. Rather than summarizing it, I've excerpted large portions of the company's release below because there's lots of detail about drilling and completion techniques as well as pipeline agreements that might get lost in a summary. Unfortunately today's announcement did not reveal production numbers by well, but that should be available soon. "Petrohawk utilized eight horizontal rigs on average in the Haynesville Shale during the first quarter, not including spudder rigs. A total of 15 operated and 16 non-operated wells were drilled. Of the operated wells, 11 were on production at the end of the quarter. Additionally, five operated wells drilled in late 2008 were put on production, bringing the total number of Haynesville Shale wells completed by the end of first quarter to 28. The average initial production rate for operated wells completed during the quarter ranged from 3.3 Mmcfe/d to 24.8 Mmcfe/d, averaging 17.1 Mmcfe/d. The average initial production rate for all operated Haynesville Shale completions to date, excluding two previously reported wells that were mechanically compromised, is approximately 18.0 Mmcfe/d. "Spud to spud times are currently averaging 60 days, with total spud to first production times averaging 80 days. Drilling efficiencies are being gained by increasing the size of the intermediate casing used, from 7 to 7 5/8 inch. This has allowed for a larger hole size while drilling the lateral, which in turn has resulted in significantly higher rates of penetration. The Company has also undertaken more progressive angle-building in the curve, and thicker geosteering targets, which have also contributed to decreased drilling days. Drilling and completion costs are currently ranging between $9.0 million and $10.5 million per well, based on average lateral lengths of 4,300 feet with 12 to 14 fracture stimulation stages per well. The Company is targeting development well costs between $8.5 and $9.5 million per well. "Petrohawk continues to employ the same basic completion procedures utilized in 2008, with some refinements. Lateral lengths are targeted at between 4,300 and 4,600 feet, with frac stages spaced approximately 325 feet apart. Each stage is comprised of four perforation clusters, two feet in length, and spaced approximately 80 to 85 feet apart. The Company utilizes a slickwater technique as well as either ceramic and resin-coated proppant, preceded by 100 mesh sand. The longest lateral length drilled to date has been approximately 4,700 feet with 14 stages of fracture stimulation. Even though these procedures have delivered outstanding well performance, Petrohawk continues to evaluate these procedures and plans to test variations on these methods to maximize well economics. "Recently drilled wells have tested several new development areas away from Elm Grove Field. The Company will conduct its 2009 program on locations in excess of 40 miles apart in both north-south and east-west directions, including portions of Caddo, Bossier, Red River and DeSoto parishes. East Texas development will primarily be directed through a joint venture partnership with EOG Resources, which expects to increase the drilling activity in the joint venture area during the year. "In addition to its existing infrastructure from operations in Elm Grove Field of northwest Louisiana, Petrohawk has completed construction on more than 50 miles of 16 inch gathering lines as well as approximately 330 Mmcf/d of treating capacity to service new production from the Haynesville Shale. The Company expects to construct an additional 112 miles of gathering pipeline and an additional 420 Mmcf/d of Company-owned treating capacity by the end of 2009. "Additionally, Petrohawk has finalized an agreement with Regency Energy Partners to secure space on Regency's Haynesville Expansion Project to transport 400 Mmcf/d from the area. 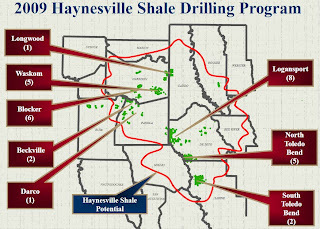 The Haynesville Expansion Project is expected to be completed by year-end 2009. Not including the incremental transportation space added by the Regency Energy Partners project, Petrohawk's total takeaway capacity builds to 850 Mmcfe/d during 2009, with additional takeaway capacity available on a non-contracted basis. Additionally, the Company has acquired firm transportation on other pipelines that it expects will provide sufficient take-away capacity for future Haynesville Shale production." In a recent interview, Matt Simmons, CEO of Simmons & Company International, an energy-oriented investment banking operation, opined on the hype surrounding the emergence of gas shale plays in North America. Simmons is probably best known as a leading proponent of "Peak Oil" and has written a book called Twilight in the Desert, The Coming Saudi Oil Shock and the World Economy . Simmons was interviewed by the Association for the Study of Peak Oil and Gas - USA. In the third part of the interview, Simmons was asked about the emerging shale plays in the U.S. Simmons has a pretty dim view of the potential new supply created by these plays, in part because of a lack of data. He considers most of the frenzy about shales to be overblown at this point, noting, "I’ve never seen the industry hype something crazier." Simmons points to the production growth statistics in the Barnett Shale, noting that much of the increase in production is linked to the addition of new wells. He also notes that peak initial production comes almost immediately and production declines quickly because of the way the operators frac the wells, so the wells don't have long-term productive lives. He doesn't see a sustainable supply increase coming from the shales, but he said we really won't see any real numbers until the states report production numbers from Q3 2009. I'm not going to get into a Peak Oil argument, but it's hard to tell whether he is pooping on shale plays to support his argument about Peak Oil or if he is on to something. In any case, what is true is that the numbers just aren't in to support either side. Check out the interview. The questions about the shale plays are at the end. The company also offered a snapshot, shown below, of what it considers to be the competitive wells near its leased property. Most of these wells aren't yet reporting, but neighboring results look pretty decent. 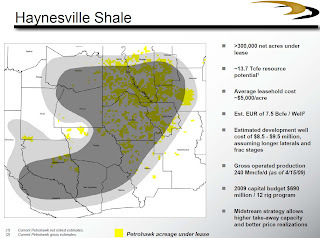 It's always interesting to see a company's take on explaining the geology of the Haynesville Shale. As with other competitors, Comstock is seeing drilling costs of approximately $8 million per well. 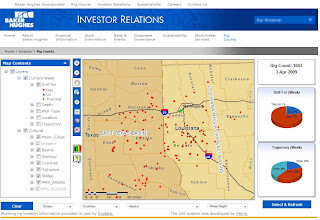 XTO Energy is a big company with its hands in gas and oil plays across the country. It has 100,000 acres in the Haynesville Shale, with leases in both Texas and Louisiana, but doesn't have a lot of completions to talk about. The company expects to drill between 15 and 20 wells in 2009 and plans to operate between two and three rigs, so there should be some news soon. 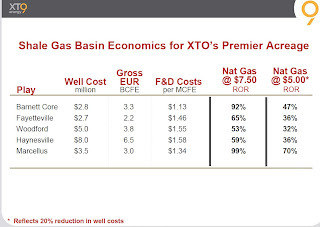 Since XTO plays in all of the major shale basins in the U.S., it is able to offer a comparison of drilling costs and expected returns based on different prices of natural gas. 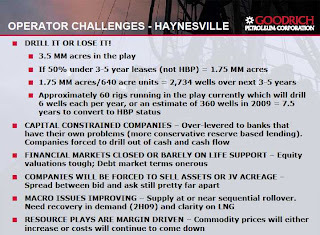 Haynesville is clearly the most expensive shale play to drill ,with well costs averaging $8 million, but the play is able to overcome these high costs and provide good returns even if gas prices are low. Berry Petroleum Company also presented at the IPAA. 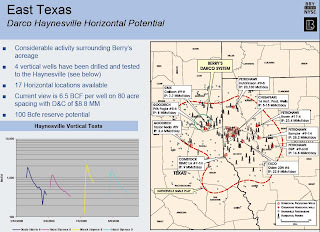 Berry has a relatively small interest in the Haynesville Shale concentrated in Texas in two fields, the Oakes Field and Darco Field. Berry has just under 5,000 gross acres in this area and drills in the Haynesville, Cotton Valley Travis Peak and Bossier Sands. The Darco Field in Harrison Co., with 2,112 gross acres, is prospective for the Haynesville Shale. Berry has drilled and tested four vertical wells in the Haynesville Play. Initial production numbers (shown graphically on the slide below) from four wells, Doyle Harris 6, Hazel Brynes 8, Meek Haynes 8 and Hazel Brynes 9, are not terribly impressive compared to some other neighboring figures shown on the map below. Since the Haynesville Play is not one of Berry's big investments, the company provided little detail on capital expenses and drilling plans for the region. GMX is pretty excited about these wells. They note that the Blocker Heirs 12H has nearly reached total depth, and all other wells have casing cemented and are ready for completion. The company president Ken Kenworthy stated, "production from these five completions could double our current production in June, 2009." Clearly getting these completions done right is the company's highest priority. St. Mary Land & Exploration presented at the IPAA Oil and Gas Symposium today and gave an update of its Haynesville Shale progress. As background on St. Mary, the company is involved in most North American gas plays and has about 50,000 net acres in the Haynesville Play, mostly in Texas. The company only operates one rig in the play, so there's not a ton of news to report. St. Mary's first well, Johnson Trust 1-2H was apparently damaged during the drilling process and only yielded a 4.1 Mmcfe/day initial production. The company is currently drilling a second vertical test well in Texas. The map below shows St. Mary's acreage relative to that of competitors and notes some of the important wells in the area, including locations of its own. Because of the low natural gas price environment, Chesapeake Energy announced today that it is going to curtail an additional 200 Mmcf/day of gas production in addition to the reduction of 200 Mmcf/day announced on March 2, 2009. This 400 Mmcf/day reduction represents 13% of Chesapeake's gross operated gas capacity. The gas wells that have been curtailed are in the Mid-Continent and Barnett Shale regions. Additionally, the new wells they are drilling will be flow constrained: "Until natural gas prices strengthen, the company plans to limit production from most newly completed wells in the Barnett and Fayetteville shales to 2 Mmcf per day and in the Marcellus and Haynesville shales to 5 and 10 Mmcf per day, respectively, in addition to the approximate 400 Mmcf per day curtailment." Yikes. Chesapeake looks at this curtailment as a deferral, which is technically correct. This action accomplishes two things for them: 1) the company can continue to drill new leases to hold them by production and 2) it doesn't have to sell gas at an unprofitable price (which will also help staunch U.S. supply, which should help improve price). More on Chesapeake's thinking: "The company is able to make this decision because of its strong financial condition and extensive natural gas hedging positions. In addition, because of the steeply declining production profile of new natural gas wells and the upward trending slope of the NYMEX natural gas futures curve, Chesapeake believes deferring production and revenue to future periods with higher natural gas prices creates greater shareholder value than selling production into the current unusually low priced natural gas market." Chesapeake has resumed 7,000 barrels per day of oil production from previously curtailed oil wells, so I guess it's not all doom and gloom for them. Check out the press release because it has good graphic data on the economics behind deferring production. That was the title of GMX Resources presentation at the Developing Unconventional Gas (DUG) conference last week. 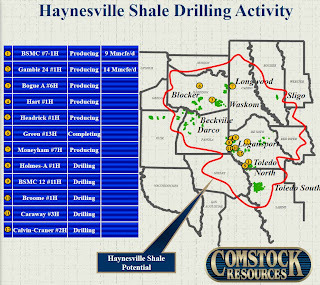 Since they are more or less a pure play on the Haynesville Shale, it is probably as much wishful thinking as a prediction. The presentation was an interesting source of information about GMX as well as others, as the excerpted slides show below. While I did pick and choose some images, I recommend reading the whole presentation (here’s a link). There is good info in the presentation about current drilling operations, technical analytical material (i.e. logs), well economics and competitive intelligence, especially on Chesapeake and Petrohawk. 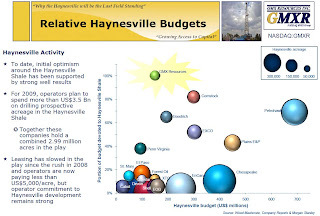 Below is a great graphic that summarizes the capital budgets of each company in the Haynesville Shale (size of dot) and how much of that budget is allocated to the Haynesville Play (vertical axis). I love it when someone can depict a lot of information in an easy to understand graphic. The presentation also had information about fracturing that was pretty interesting. 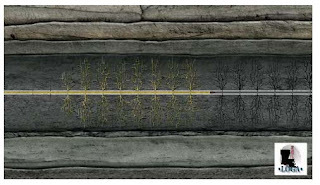 It showed a graphic depiction of fracturing with slides showing an aerial shot and a cross section. There was also an interesting graphical depiction of the capex behind well cost, showing the that companies are reducing costs by squeezing suppliers and speeding time to market for the gas. The bar chart shows the different components of the costs of a well. While it's nice to see a breakdown, the category titles are vague, and the reader is left wondering whether or not land acquisition costs are included in the well economics. GMX engaged in a lengthy discussion of hedging. Having locked in good forward selling prices is vital for the survival of the E&P companies. There are a few good slides in the presentation addressing this, but I won’t go into that detail. GMX also comes out saying that they are confident that gas prices will rise (although I read a quote by Dan Pickering of Tudor Pickering Holt & Co, an influential analyst, noting that there are lots of people talking about $2 gas by the fall (note: he didn’t say that he was predicting this)). GMX quotes a Bloomberg article that notes that a survey of 20 analysts sees gas trading at $7/MBtu in January 2010 and January 2010 futures are trading at a 49% premium to the current price. 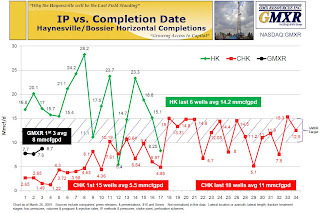 Finally, I have included a couple of slides showing current drilling activity in the Haynesville Play. Note that the second slide has good detail by company for the Texas side of the play. The other day, I noted that there is a growing chorus of voices that is suggesting that the rosy profit and return projections from the Haynesville Shale drillers may be underestimating the true costs of drilling Haynesville wells. I'm a numbers guy, not a geologist, so while I appreciate returns analyses, I can't fully understand and analyze the inputs used to come up with the numbers. That's the case here - the companies know all of the inputs and those of us on the outside have to make educated guesses about some of the (most important) inputs. 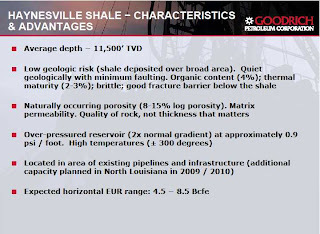 In GMX Resources' presentation at the Developing Unconventional Gas (DUG) conference earlier this week, the company published some good detail on the well economics. In a later post, I'll show a chart with pro forma well capital expenses (the cost side). Below are a few slides showing some of the key inputs into the revenue side of things, including decline curves (from a hypothetical well with 5.4 Bcfe EUR and three different cost scenarios), some daily production data on GMX well Baldwin #17H, and some return scenarios based on different cost and gas price assumptions. Because publicly traded companies are required to be forthcoming with important information, there is a lot of interesting data, but there is still a lack of transparency so that one can't fully vet the numbers. 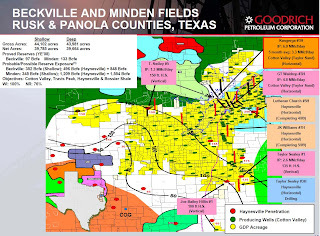 True Haynesville Well Economics Worse Than Reported? First let me say that I'm a generalist and am no expert on the oil and gas industry. There are plenty of folks out there with highly specialized backgrounds in engineering and oil and gas finance who can talk about this stuff with a much higher degree of accuracy. 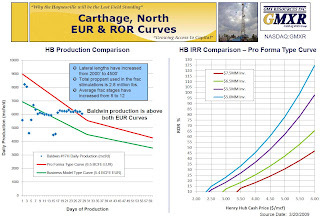 I've read a couple of accounts recently (#1: Arthur Berman, #2: Keith Schaefer in the form of lengthy blog posts) that suggest the gas drillers in the Haynesville Shale are not correctly accounting for the true costs of drilling a well in their rosy press releases about their Haynesville successes. On the surface, I agree with some of the points made (i.e. fully accounting for the acquisition of the land) and disagree with others (i.e. amortizing the cost of debt in individual well costs), but I'm sure there is a large degree of truth in these analyses. But it is important to note that these analysts are looking at the companies from the outside-in and don't have all of the information the producers have (i.e. real time production information and individual well decline curves), and sometimes analysts place a higher value on reporting something before the crowd or being controversial than they do on being 100% right (they're selling something too!). Quibbles aside, there is a growing chorus of voices that suggest the economics of the Haynesville Shale may not be as rosy at current prices as we're being led to believe. This isn't a huge surprise. It is well known that these horizontal wells are expensive, and the leasing frenzy created some very high lease costs for producers. Because companies are under the gun to drill on the leases because they only have 3-5 years to hold the leases by production, the price of natural gas isn't going to be the ultimate determination of whether or not they drill. The underlying suggestion (and statement by some) is that producers are putting out rosy numbers to boost their stock prices. There is a problem here: if this is true and the economics are false, these companies would have their shorts sued off by angry investors. There is certainly a precedent for this and there are entire law firms that do nothing but handle investor class action suits. These companies are smarter than this. Aren't they? OR do they know they are drilling non-economic wells for the purpose of holding leases by production but are producing glowing reports of successes so the stock market doesn't kill them while the price of gas is so low? Ultimately it is good in the long run for a company to spend now to hold the lease rather than lose it because they are too afraid of stock market analysts. OR are these wells actually economically successful and this is a smokescreen by individuals who have a bully pulpit on the Internet? I don't know. Another bottom line conclusion: this might be a cautionary note for people who are still on the fence about leasing and are on the verge of getting "force pooled." If the returns are not going to surpass the costs, these land owners will get nothing, while the people who did sign leases will at least get their royalty percentage. Royalties are paid upfront. Those who are force pooled get paid on the back end, and if the well is not a money maker the back end is just that. The US Department of Energy (DOE) has issued a Funding Opportunity Announcement to select and award projects in this fiscal year that focus on "water resources and water management for shale gas development as well as the science to support regulatory streamlining and permitting associated with shale gas development" as well as water issues related to Alaskan oil and gas. Here is a synopsis. There is not a lot of money at stake ($3 million total with individual projects accounting for $500K to $1 million each), but it's good to see the DOE looking at this issue? This is interesting because water use and water rights are going to be huge issues for this country in the 21st century. Water will be especially important as we 1) continue our westward migration in to more arid lands and 2) global warming looms with the potential for unexpected (and heretofore unknown) weather changes. While the Haynesville Shale doesn't have the same water issues as you might see in Colorado or Wyoming, there will be lots of wells that will require a great deal of water. I think it is wise to get ahead of this issue, especially in consideration of the externalities of drilling. If we are to secure our nation's energy future, we will have to drill in the U.S., and that will lead to unintended surface impacts. Best to be proactive rather than reactive. Did you ever see the Jack Nicholson movie Chinatown? - Develop and demonstrate long-term cost-effective on-site or central processing facility water treatment operational performance and cost data in emerging shale gas plays such as the Marcellus, Fayetteville, Haynesville, or Woodford. Demonstrations shall be conducted at a size that is easily scalable to field operations. - Develop watershed resource flow modeling to support water supply and disposal issues related to siting and permitting for shale gas development. - Develop cost-effective pretreatment methods to treat or remove constituents from produced water or hydraulic fracturing flowback water to improve downstream treatment and/or re-use options for shale gas development. - Develop and demonstrate cost effective produced water management methods that use a systems approach, consider lifecycle analysis, demonstrate extraction of high-value products from produced water and create value or additional benefits on the upstream and/or downstream side of the produced water treatment to improve overall economics." This is old news, but I noticed a release from September 2008 from Mainland Resources that the company had entered into a letter of intent to acquire 5,000 net acres in southwestern Mississippi in the Mississippi Interior Salt Basin for the purpose of drilling test wells to see if there was Haynesville Shale potential. I haven't heard anything else about this but thought it was interesting to note. The press release got reprinted in numerous publications, but I haven't seen anything else about it. Was it an attempt to boost the price of Mainland? They seem very interested in self-promotion. Who knows. "A number of USGS and US Department of Energy resource assessments have been commissioned over this area over the last decade. All report the deep gas potential of the area, pointing to the Upper Jurassic as a favorable exploration target. According to public records, no wells have been drilled to test the Haynesville Shale formation in the target region to date. 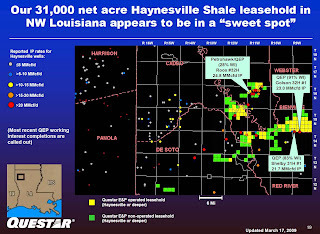 "Company President Mike Newport states, 'We have data that suggests the potential Haynesville Shale in this region could be similar in nature to the gas bearing Haynesville Shale in northwest Louisiana. Our geological team believes that this could be just as productive as the groundwork that’s been laid in the Louisiana play.'" OK, so I said I wasn't going to talk about the Little Gypsy plant conversion for a while. I wouldn't but for the fact that 1) I want to report the latest status and 2) I have a mea culpa. First, the LA Public Service Commission did not act on Entergy's request to shelve the project for three plus years, but the previous application is pretty much dead (article from New Orleans CityBusiness). Second, mea culpa - I was railing against the use of coal as the fuel for the converted plant. In fact, it was to be petroleum coke, a refinery byproduct. I got the exact fuel wrong, but it is still a dirty fuel and would be subject to intense upcoming carbon regulation. Entergy is now considering using a combined cycle gas turbine, a more efficient way of generating power with natural gas. Much better! - The geology and geography of the play is very favorable: the deposit is widely distributed and the shale has good geologic features: little faulting, high pressure, high temperature, naturally occurring porosity, etc. It is also located among existing drilling infrastructure and has access to expanding takeaway infrastructure. 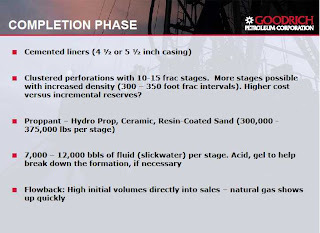 - Goodrich estimates that there are 3.5 million acres in the play and assuming half of it is under a 3-5 year lease scheme that leaves 1.75 million acres that must be drilled or lost. Assuming a 640 acre unit, that implies 2,734 new wells over the next 3-5 years. Right now there are 60 rigs averaging 6 new wells a year. That implies 360 new wells per year, which means that it would take 7.5 years to drill the 1.75 million acres. In other words, the exploration companies are going to need to pick up the pace of drilling because they have a huge incentive to drill and drill quickly. - It is a very difficult market to drill because capital is so constrained and drilling is very capital intensive. Bottom line is that while it is very doom and gloom right now, the economics of the Haynesville Play are very appealing (even in this low gas price environment), and the E&P companies need to drill their leases quickly or face losing them starting in the spring of 2012. St. Mary Land and Exploration announced that it has brought to market its first Haynesville Shale well. The Johnson Trust 1-2 well, located in the Spider Field in central De Soto Parish, Louisiana, had a total measured depth of 15,100 feet, and was completed with a 10 stage hydraulic fracture treatment over the 3,400 foot lateral. The 24 hour production rate from the well was a somewhat disappointing 4.1 MMcf of gas and 525 Bbls of load water at a flowing casing pressure of 3,150 psi on an 18/64th inch choke. It's not terrible, but other neighboring wells are doing better. The company believes that the well may have been damaged during drilling or completion and is working with its contractors to see what's going on. From the company's release: "St. Mary has 10,000 net acres with potential for the Haynesville Shale in Louisiana, 4,200 of which are located in the Spider Field. The remaining 40,000 net acres of the Company’s total 50,000 net acres are located in East Texas. St. Mary’s second Haynesville well has commenced drilling in northern San Augustine County, Texas. After coring the Haynesville section, this well will be drilled down to the deeper Cotton Valley Lime formation for evaluation purposes. 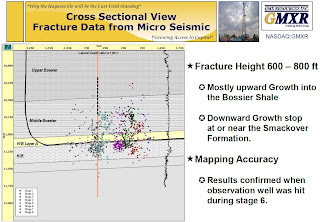 St. Mary currently expects to complete the well as a vertical Haynesville test." We've been eagerly waiting results from St. Mary and are somewhat disappointed (I'm sure they are too!). Hopefully they can get things straightened out and see some better results. Here is a good article on H.R. 1835, the NAT GAS Act, which promotes the use natural gas for the transportation industry. The passage of this bill would be huge for the natural gas industry. (Full text of bill.) If this does move towards approval it is likely to change, but it is a good start. I was interested to see the list of bill co-sponsors. I'm disappointed that no Congressmen from Louisiana or east Texas helped sponsor a bill that will so significantly help an industry in their state. (Note: the closest sponsor was Rep. Michael Burgess (R) from north Texas - somewhere between the Barnett and Woodford Shales.) The Haynesville Shale should be a significant economic driver, especially for Louisiana, and our politicians should act accordingly. There was a brief but interesting article in Platts about LNG and the possibility that LNG storage in the U.S. might fill up by the end of summer. The article featured comments by the CEO of LNG importer Cheniere Energy Charif Souki. Souki notes that there were a number of technical issues in 2008 that kept LNG exports from gas producing nations low. Now that these hurdles have been eliminated, there should be a glut of LNG in the market. Based on rates being offered these days, don't expect the price of natural gas to go much above $4 for the near future. If storage facilities fill up, the oversupply might result in gas prices going as low as $2/MMBtu. As a result of the LNG glut, oversupply will continue to be an issue, but demand is going to be the driver of recovery. As has been noted over and over again, the price of natural gas isn't going to recover until the economy picks up again. The New Orleans Times Picayune had a good piece on the delay of the Little Gypsy power plant in Montz, LA. I've written a couple of times on how foolish I think it is for one of the biggest utilities in the state of Louisiana to retrofit a natural gas power generating plat to be a coal fired plant. 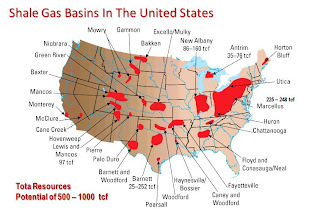 Why import coal from out of state when you've got the Haynesville Shale, which experts are coming to agree is the largest natural gas deposit in the country, in your own state. Sure, they don't want to be a slave to energy prices, but it's going to happen to them anyway - it's their business - and on top of that they've got a mechanism in place to pass on the price hikes to their customers. The project is on hold for at least three years, so I'll get off my soapbox for now. There were a couple of interesting articles on Marketwatch.com this week discussing the price of natural gas and the LNG industry and their relationship going forward (article 1 - natural gas price; article 2- LNG). The discussion of the LNG industry, in particular, is eye opening. There has been a huge amount of capital invested in LNG infrastructure to facilitate the import of liquefied natural gas (it arrives in a frozen state and is reheated to a liquid state and then put in pipelines for delivery or storage). The U.S. has an enormous amount of LNG receipt infrastructure and the largest storage capacity in the world. Several long-term projects have recently been completed or will be completed soon. While demand has been low lately, many nations that are drilling for gas and loading it in ships are desperate to sell it to anyone. This could lead to LNG flooding the market. This expectation is probably one of the main reasons the price of natural gas in the U.S. has stayed so low. The big LNG producers are Algeria, Australia, Indonesia, Nigeria, Oman, Qatar and Russia, as well as Trinidad and Tobago. Some of these are developing third world countries that desperately need the cash. As a result, they will produce it and ship it no matter how low the price is. The three largest buyers of LNG in the world, Korea, Japan and Spain, currently have plenty of supply on hand because of a mild winter, lower demand and a new natural-gas pipeline in Europe tapping natural-gas fields in Algeria. The excess supply is likely to end up in the U.S. because we have so much supply infrastructure. And it's not just a bunch of foreign companies dumping LNG on our shores. Most of the big integrated oil and gas companies have a presence in the industry. Exxon, most notably, has a very large operation in Qatar. LNG can have a frightening impact on the price and supply of natural gas for years to come. The weekly survey of active rigs by Baker Hughes shows that the U.S. rig count is up this week by 4 to 1,043. It is still down 787 rigs from this time last year. On the cool tool side, Baker Hughes has an interactive GIS tool that lets you zoom into any region of North America and see the active rigs. You can drill down by pressing the information button and get the specifics on the drilling project. Very neat. House Resolution 1835, the New Alternative Transportation to Give Americans Solutions (NAT GAS) Act was introduced today by Congressmen Dan Boren, John Larson, and John Sullivan. 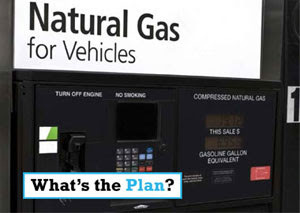 The proposed act creates incentives for the adoption of natural gas for motor vehicles. "America`s national and economic security depends on moving off foreign oil as quickly as possible. Natural gas is the cleanest, most abundant, most economical domestic fuel to replace imported diesel. The U.S. has enough natural gas reserves to last us more than 118 years-we should turn to it as an immediate replacement for foreign oil in fleets and heavy duty vehicles. A battery can`t move an 18-wheeler-the technology isnt there yet. Natural gas buys us a bridge to the future. "The NAT GAS Act will provide the immediate incentives and long-term stability for companies to seriously move from imported diesel and gasoline to domestic natural gas. Last month, AT&T announced a program to replace 8,000 vehicles - one fifth of its fleet - to run on natural gas. I know that this legislation will motivate many others, from major corporations and municipalities operating fleets to individual owner-operators, to choose a truly American fuel at the pump." This is a huge step in the right direction. In my opinion, moving to a natural gas standard for vehicles is absolutely necessary for the future of this nation. It is a domestic fuel that is cleaner and less costly that oil. We Need a “Natural Gas Standard” in the U.S. It is becoming clear that the United States is on the verge of becoming one of the largest natural gas producers in the world. The advent of new exploration techniques and technology has opened up a plethora of new natural gas opportunities (see image below). We are so fixated on oil and our slave-master relationship with foreign countries that we are not taking seriously our enormous supply of natural gas. Our economy is oil-driven, much of it because of our transportation needs. Buses, cars, trains, utility generation – convert these things to a natural gas standard and we would employ a cleaner, more economical fuel and one that can be 100% home grown. The NAT GAS Act (H.R. 1835), proposed yesterday in Congress, is a great way to start this process. Being a free market economy, the government cannot specifically dictate this change. But the government needs to recognize the potential of natural gas. Right now, the price of gas is low because of high supply and the knowledge that natural gas production is poised to increase dramatically. There is this huge, barely tapped supply beneath our feet. The government can use market incentives to implement a conversion to a natural gas standard. With increases in demand coupled with the increases in supply, the market price for gas should trend towards one that makes production economically feasible while keeping retail consumption at a reasonable price. It might be tempting to dismiss the Pickens Plan as self-serving, given T. Boone Pickens’ investment in natural gas and wind technology. Same with CNG NOW or the American Clean Skies Foundation, they are both outgrowths of companies trying to commercialize their products to a wider audience. We dismiss these ideas at our own peril, however. I think there is great validity to these concepts. What can the federal government do to help the market adopt natural gas? It can create incentives for the conversion of oil and coal uses, such as incentives to convert cars and buses to natural gas or develop incentives (tax credits, carbon trading?) to convert aging coal plants to natural gas. To achieve widespread consumer vehicle use, car makers first must see a market for natural gas cars. The government can set targets and create a “carrot” or “stick” incentive for successful achievement of the goal. There also has to be a retail infrastructure to sell natural gas to consumers. This can be achieved through numerous ways that can make both Republicans and Democrats happy. There is lots of talk about a green jobs revolution, and I think natural gas should be considered part of it. It’s great to have a long-term vision, but we need a solution now. Forget the notion that biofuels will save us. They use up valuable farm land (and throw off the economics of producing our own food! ), consume valuable water to grow and require petroleum to harvest. There is no reason to import food so Midwestern farmers can produce overpriced/subsidized fuel for cars. “Clean coal” would be great if carbon sequestration could be achieved and on an economically feasible basis. Right now, it’s not possible. I’m a great believer in solar, geothermal, wind and other alternative energy, but we are far away from a viable solar car or truck (not just a rechargeable battery operated car) and we need a solution now. Energy success will come from a balanced energy portfolio, largely balanced by alternative energy sources, to help offset resource price spikes as well. Natural gas is the way forward for reasons political, economic and environmental. The United States can become a cartel of one. We live in a global economy, but I see no reason not to be self-sustaining when it comes to our energy needs. There is no one silver bullet solution, but this is the best we've got. Entergy Louisiana announced today that it has filed a report with the LA Public Service Commission recommending a three year or more delay in the repowering of its Little Gypsy plant. Entergy had proposed converting an old gas-fired plant into a coal plant. I thought this was particularly a ridiculous idea and counter to the economy of the state and the region. Why import coal when you've got the biggest supply of gas in the country under your feet?!?! The economics of the project have proved unworkable, so the conversion project has been shut down for now. Good riddance! "The utility says the move was based on “significant uncertainties in the economics of the project,” stemming from the recent decline in natural gas prices, changing federal energy policies and the current financial crisis. "The utility estimates that canceling the project will cost about $300 million. "The Public Service Commission last month rescinded its approval of the project, which called for converting Entergy’s natural gas-powered plant in Montz to run on coal and petroleum coke, directing the utility to present a report showing its plans remained economically feasible. "Environmental groups have staunchly opposed the project, noting that it would lead to an increase in greenhouse gas emissions and that new federal carbon regulations could mean the project would wind up costing ratepayers significantly more than advertised. " 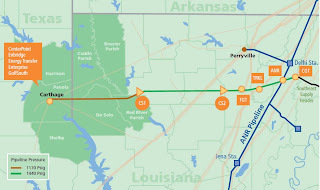 ANR Pipeline Company, a subsidiary of Trans Canada, has announced a lateral pipeline to connect the Haynesville Shale to its main ANR pipeline, which runs between southern Louisiana and the upper Midwest. 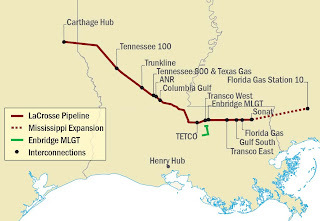 The pipeline, which is now in open season (for indications of interest), will run from Carthage, TX to interconnect with the ANR pipeline, just south of Delhi, LA. Here is a link to the project overview.